(Cont.) Second was Versailles. I hadn't expected to attend, but went with a Christmas visitor. I was surprised and pleased from the first objects in the first room. Plenty of sweet paintings of powdered faces, sturdy marble and lead and porphyry works in 3D, homely (if indulgent) things like lovely floral china servings and a menu that records one lunch for the king, less homely but impressive things like tapestries and huge rugs, a desperately indulgent story of failing to plumb fountains for the ill-located Palace. 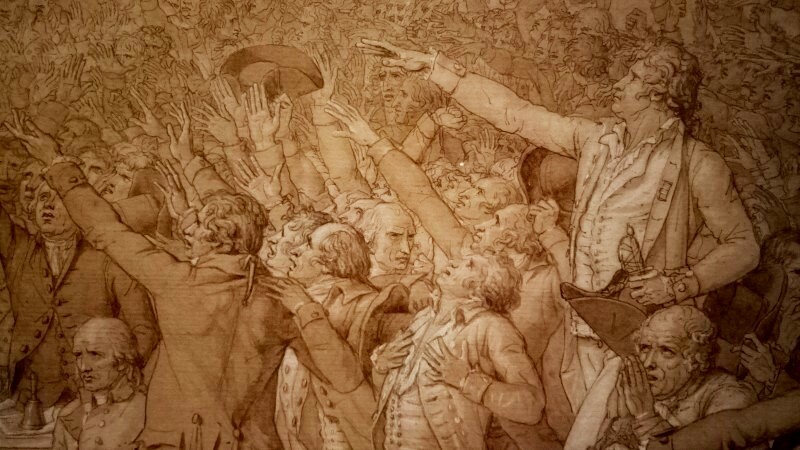 It all had me welcoming revolution by the end, and sure enough, to my pleasure and the gasp of a woman beside me (her comment was "it's in all the text books"), David's pen-and-ink sketch of the oath at the tennis court (Le serment du Jeu de paume / Jacques-Louis David). Wow! Revolutionary politics in superbly detailed drawing. Fabulous. And a final, lightly despairing painting of Louis XVI awaiting his fate. So goes such indulgence (as I wonder why modern Australia still has a Queen). 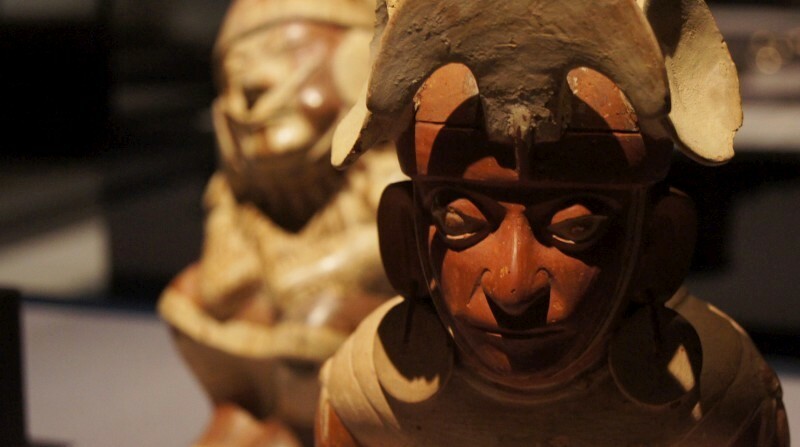 These were two informative and attractive exhibitions worthy of our time and monies. 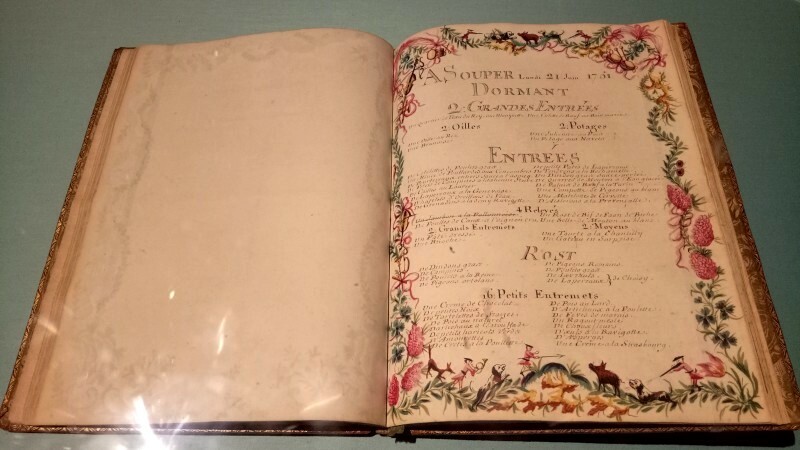 Versailles : Treasures from the palace is at the National Gallery of Australia. I know I'm being ridiculously lazy with few posts, but hey it's Christmas. 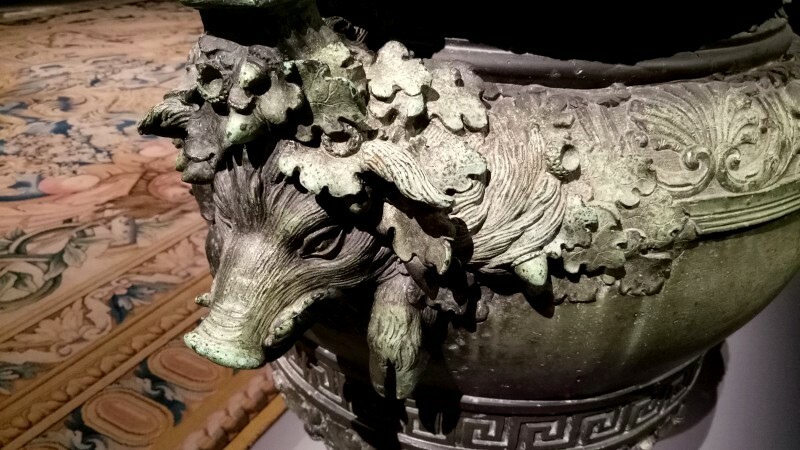 In the meantime, just a short note and some pics of the two blockbuster exhibitions currently in Canberra. 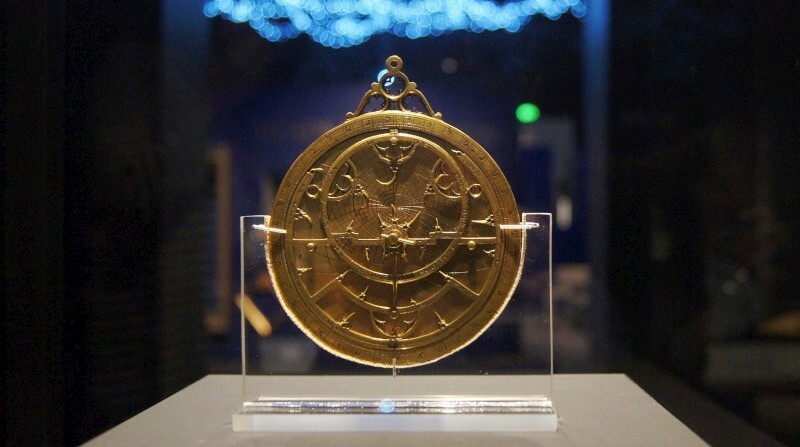 A History of the world in 100 objects : From the British Museum is at the National Museum of Australia. When I've attended concerts in Canberra over the years, there's usually been a photographer. For jazz, it was Brian Stewart and I was lucky enough to launch his exhibition at early this year at Smith's. I wrote about it on CJ as a golden era. 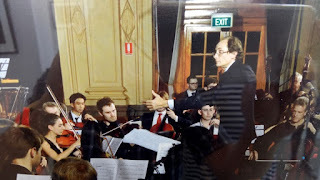 For classics, it was Peter Hislop and I've just attended his exhibition in the decidedly upmarket location of the High Court Foyer, now a popular classical music venue. Funnily, as I entered a guitar duo, Duo Amythis, was playing the final bars of a yet another concert. I hadn't known. Then Peters pics. Unlike Brian's, these are colour; like Brians's, they are digital. I loved the behind-the-scenes pics, especially when I knew the subjects and occasionally when I remembered the gig. Also the arrays of performers (choirs or orchestras) in black or common colours that is so attractive in this scene: it's great fun to find familiar faces. Peter's earliest pics go back to the first ACO gig in Sydney in 1976, so he's got serious history. These pics were mainly around Canberra, at Llewellyn or CIMF or NGA or the High Court itself, of local or visiting stars like Peter Sculthorpe, Roland Peelman, Chris Latham, AYO. I was amused to see jazz got a shoe in with John Mackey and Miro Bukovsky's shadow. The photos were too few, but interesting. I enjoyed his eye, it's good and eminently professional. The digital colour was just a little edgy in a big print, but it's an unavoidable vestige of the technology. It's good to see performers for the ordinary people they so often are. My mechanic surprised me the other day saying he'd played violin in an orchestra in his school days and had completed several years of AMEB. He went on to talk of the good, even raunchy, times of the students off at camp, and that the fine music types are not much different from the rock stars. There's a window on some of that ordinary humanity here. Nice. Excuse the pics; it was impossible to quote through glass in a bright High Court foyer. Peter Hislop displayed a small selection of a very large collection of photos of music making in Canberra. 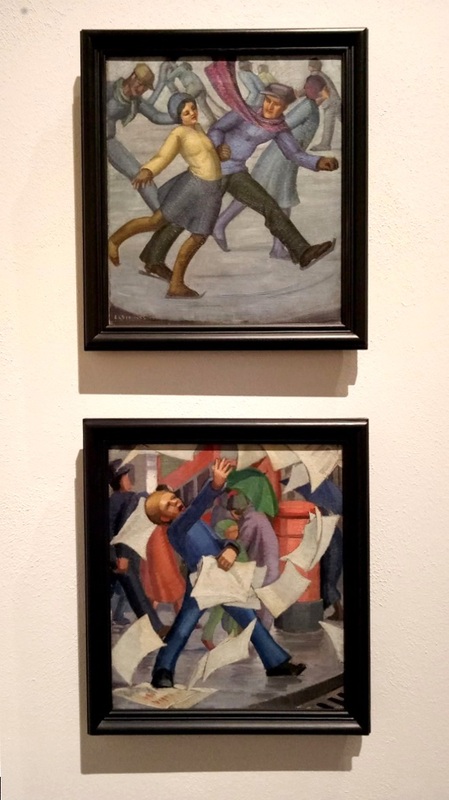 PS, I dropped into the National Gallery to waste a few minutes and found a new fave: Ethel Spowers. Here are some pics. There are answers here, but to totally different questions. 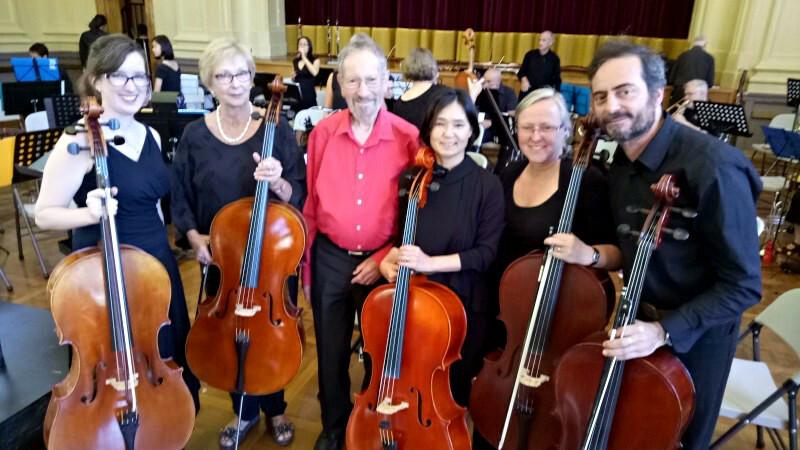 We went to hear the latest concert of our mates, the Australian Haydn Ensemble, and it was fabulous. This was a larger ensemble for the night - they do a bigger ensemble every now and then. We've followed AHE since early days and they are seriously getting in their stride now, having released their wonderful first album on ABC records, and with a following and a history, they are developing a sense of presence and real purpose and, from the frequent open smiles, a great pleasure in the whole outing. AHE brings players from around Australia, but also from OS, not least some expat Aussies from London. 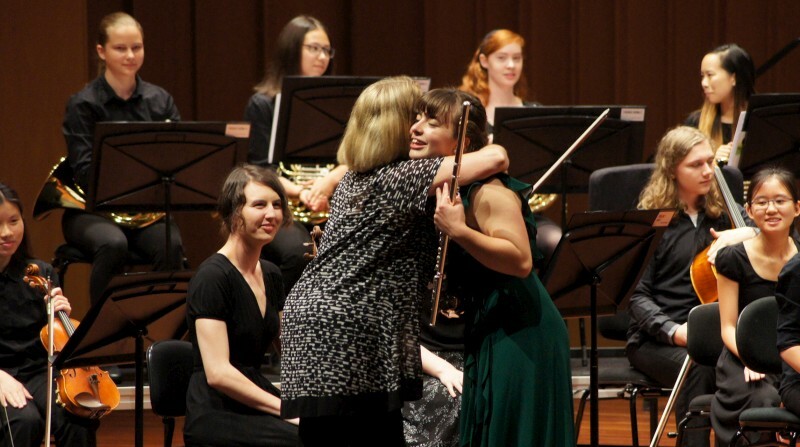 This program featured a lineup of 21 in various combinations, guest directed by Eric Helyard with leader Skye McIntosh and solo flautist Melissa Farrow. The music was three of CPE Bach - Sinfonia E min Wq.178, Flute concerto D minor Wq.22 and Harpsichord concerto F minor Wq.43/1 - and one of namesake Haydn - Symphony no.49 F minor "La Passione". The whole was played with great dynamics and a fabulous sense to time and togetherness - I was in awe. We were lucky to be up front. Melissa's flute was clearly articulated and massively quick. I was stunned by the fast scalar lines with tack sharp tonguing. Fabulous. Then Erin with his harpsichord concerto part, again fast as, sweeping through phrasings that spelt harmonies that moved at will. Fabulous in playing and in the intellectual feat of the composition. Then Haydn. I'd played this (NCO 20 Aug 2016) so knew it intimately and that's both exciting and engrossing. The score doesn't look too scary, but this baroque era is unrelenting with occasional tripwire rhythms and sudden double-time phrases, so it can be tricky. 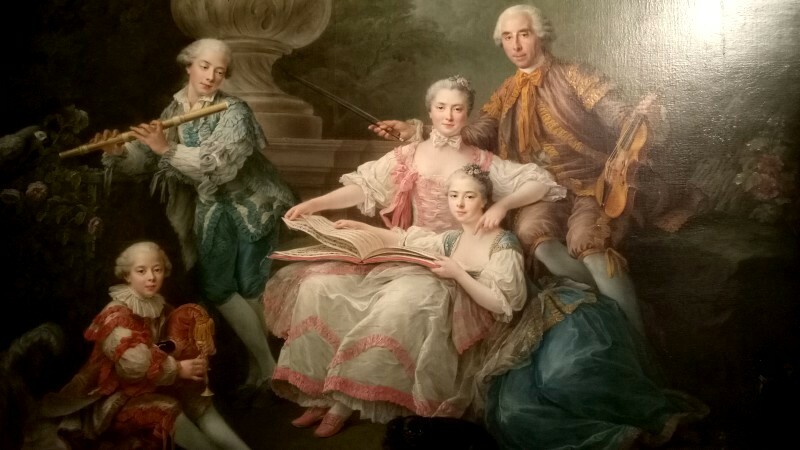 And what pleasure to hear such experts laying into a tune you know: the easy bowing, nimble fingerings, comfortable reading, all on gut with baroque bows. 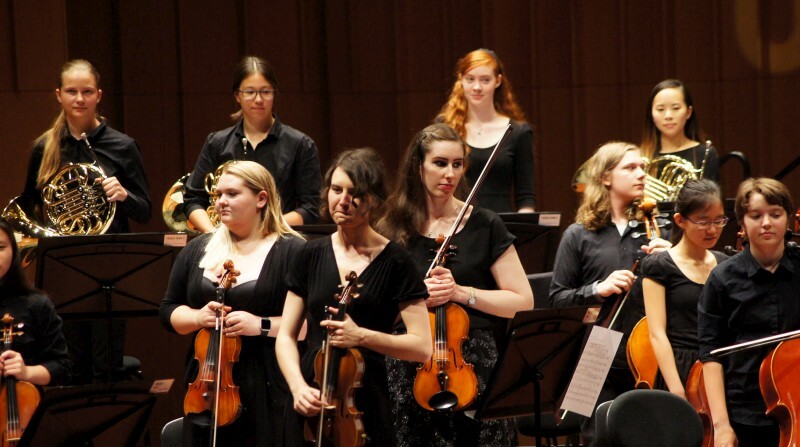 And of course, the horns and bassoons and flutes and the rest, appearing inexorably but subtly amongst the strings, of the passages passed to seconds or violas, or Skye's lovely, purposeful solo-as-leader melodies. Suffice to say I enjoyed this immensely and it had us driving home, thinking of London, where so many concerts must be like this. A huge pleasure. 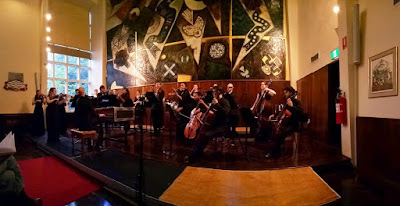 Australian Haydn Ensemble performed CPE Bach and Haydn at the Great Hall at ANU University House under Erin Helyard (conductor, harpsichord soloist) and Skye McIntosh (violin, leader, musical director) with Melissa Farrow (flute soloist) and 18 others. 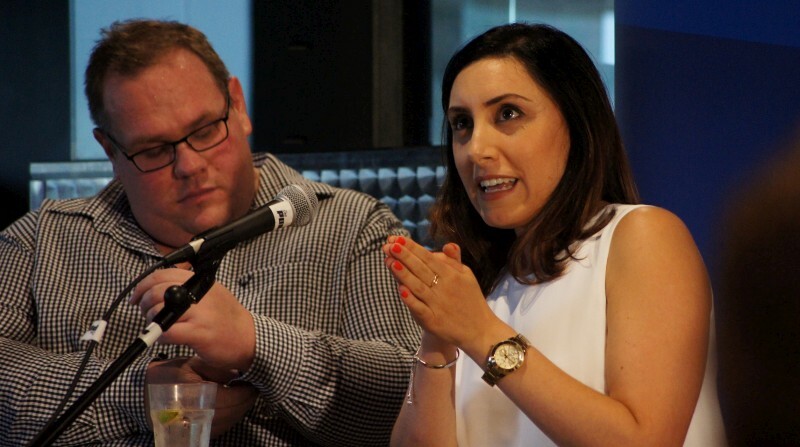 This was the end of year wrap-up at Politics in the Pub, chaired by Australia Institute director Ben Oquist with journalists Rob Harris (Herald Sun), Daniela Ritorto (SBS News), Matthew Knott (Fairfax) and Alice Workman (Buzzfeed) and I was disappointed. I guess I have to recognise these are all press-pack journos form Parliament House, so that's what busies them and pays their keep and I doubt there's much time for anything else, and they were called to speak for the 2016 Political Wrap. But despite the concerns about 24-hour news cycle and expectations of continual breaks and the sheer speed of Australian politics, this was all "Beltway' stuff. Probably it is all "Beltway" stuff because of that - the journos are just too busy to have time to think. I was interested that they remembered Turnbull's press conference clashing with Usain Bolt and Turnbull speaking at some club or other when the Brexit result was announced and Turnbull's delayed and caustic speech after the election and Shorten's treating it all like a win and the year as the "rise of the deplorables" and that photo of George Christensen. All jokey, and I guess you need this to survive the blistering pace in this bickering place. And it was interesting to hear of threats to Turnbull and likelihood of another PM being rolled and incumbency as the new burden, of Pauline Hansen as the big winner of the year, that she runs a "slick operation" after 20 years in politics and that she avoids the press and publishes videos direct to followers on FB. There were questions about post-truth and what to do about it (MK admitted he'd been fooled by one for a while - so was I): media has a role, but the public must be "skeptical consumers". About the saving Medicare stoush and opinion vs facts; di Natale representing his supporters who allow no deals with government; economic insecurity not being enough to explain Trump, culture is also important; that disdain for politics has always been around, but it's highlighted now, partly by the double dissolution election (One Nation would only have won one quota in a normal election); about incumbency and consistency and policies (ACT cited here, but demographics is also an issue); about sneering at bogans and need for conversation; about SkyNews as an internal broadcast between politicians (interesting). But not a mention that I remember of the end-game issue of climate change, and nothing substantial outside Australia and nothing at all outside US/UK. So we remained in that puddle of inbred concerns and battling that we all rail against. I wanted to ask "how long can they keep blaming Labor" but my question, too, would have been in the local swamp (excuse the borrowing). As the Arctic melts and our kids' future with it, along with 1% and education and poverty and the rest. Things are mighty wrong and Trump/Brexit are not the answer but sadly no answers here. We all just keep getting consumed. 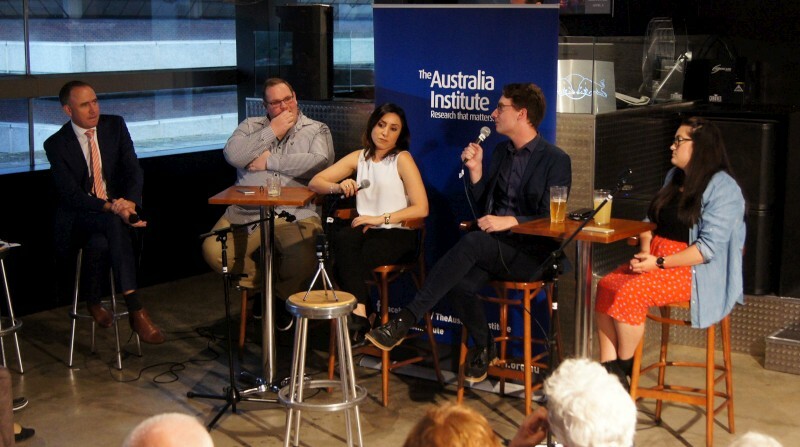 The Australia Institute staged its Politics in the Pub 2016 Politics wrap-up chaired by director Ben Oquist with journalists Rob Harris (Herald Sun), Daniela Ritorto (SBS News), Matthew Knott (Fairfax) and Alice Workman (Buzzfeed). Maybe I say this after every concert. This Maruki concert was as hard as anything I've played. 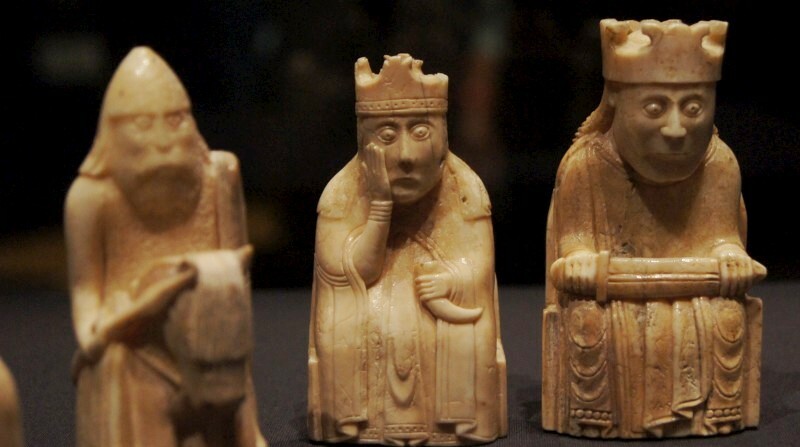 It's also the best we've played the pieces (my perennial "she'll be right on the night" optimism). 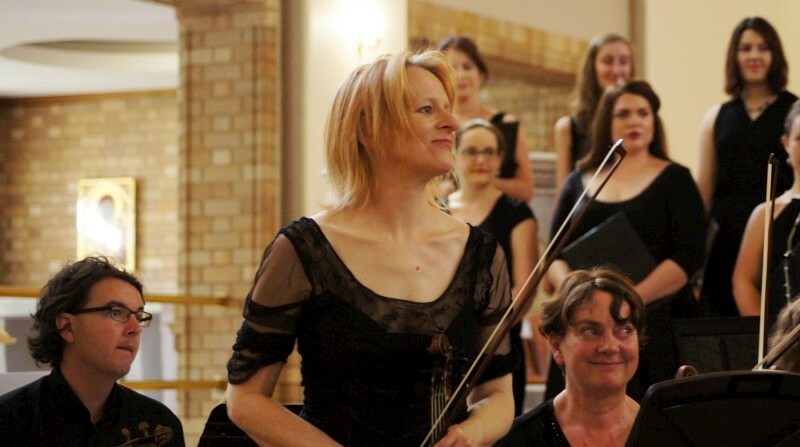 This Maruki concert was the best we've played these pieces. And the pieces were tricky. Saint-Saens Havanaise is a pretty easy read despite frequent changes of time signature and a tricky passage of thirds on the basses. 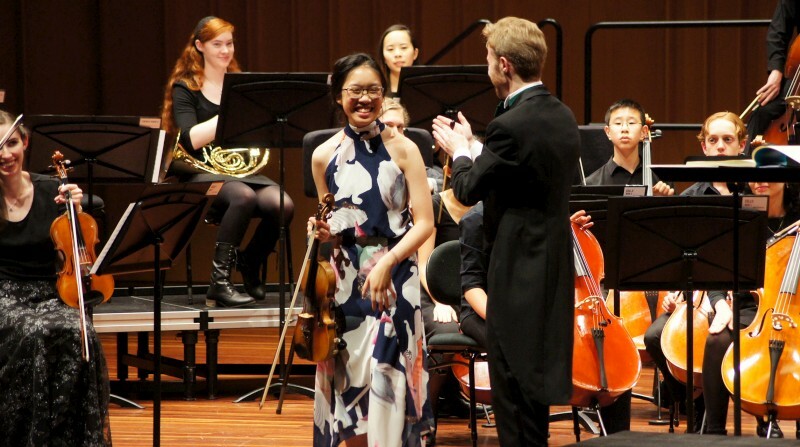 That went nicely with the very capable Georgina Tran playing the violin solo out front. So young, so capable. Then Rossini William Tell overture. Everyone knows this one, especially the stormy, fast, tricky bit, but the work is four parts run in together with several tricky lines (not least chromatic runs at brisk speed and some latin dotted-crochet arpeggio-like phrases that jump into the thumb positions) but to sit on that idyllic pastoral melody or to bounce the two bass parts against each other (one playing on 1,2,3; the other playing an octave up on 1+,2+,3+) was a pleasure. When I got time, I noticed some impressively neat, fast, nicely intoned high strings which were a pleasure. 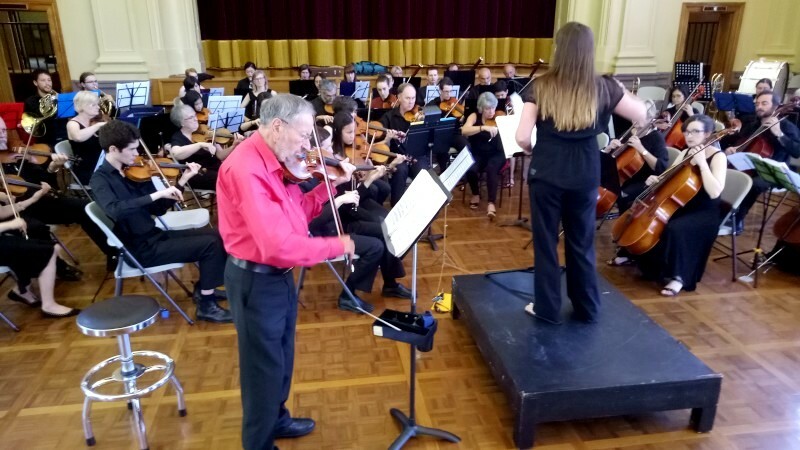 Then John Gould, our leader, taking the solo violin role in Bruch violin concerto no.1. It's always a huge pleasure to play with a true professional (LSO principal viola, retired) and to hear his playing, so well phrased, incisive, intoned. (Mostly we hear his humourous tales of conductors and orchestras at rehearsal instead). 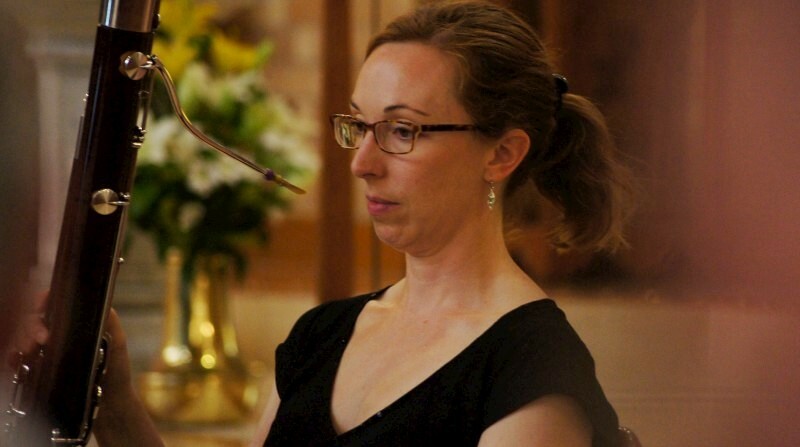 Maruki member and ANUSOM graduate Elisha Adams took the baton to lead Bruch (her major was violin performance but she's found a recent interest in conducting). She did nicely with clear leads and I liked when the basses got a big smile for coming in on time after a particularly long count (I guess she was relieved). Then afternoon tea and the big work of the day: Dvorak symphony no.7 D minor. This may be the most difficult work I've played - symphonic in scope, complex with interleaved themes and phrasings, neat but also unpredicted. It's a work you need to know well or read very carefully, and we did it some community orchestra justice. So, another successful and challenging outing for Maruki. Maruki Community Orchestra performed Saint-Saens, Bruch, Rossini and Dvorak at Albert Hall under John Gould and Elisha Adams (conductors) with soloists Georgina Chan and John Gould (violin). It's coming on time to relax for Christmas, so that's my excuse. Here's my catchup on last Thursday, somewhat late and no pics. Morning was two performances, both recorded. 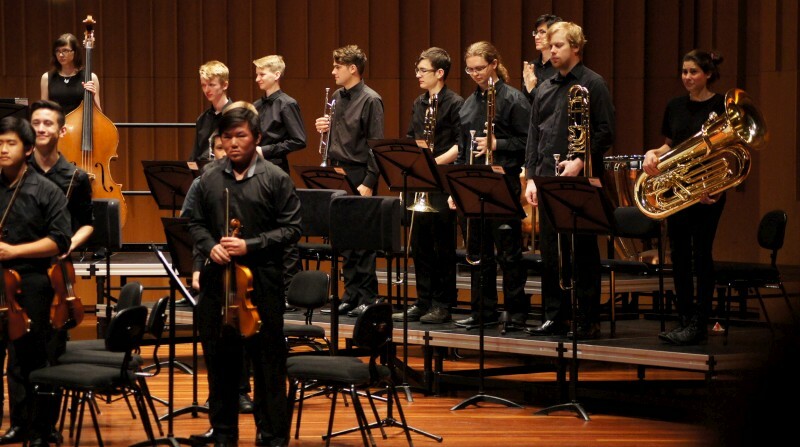 Firstly, the Wind Ensemble from Brindabella Orchestra playing one of literally hundreds of Overture/suites by Telemann, this one in D major with four movements comprised of formal dance styles of the era. The Wind Ensemble was a quintet comprising 2xflute, 2xoboe, clarinet, horn and bassoon. Then the U3A Recorder Orchestra led my Margaret Wright. 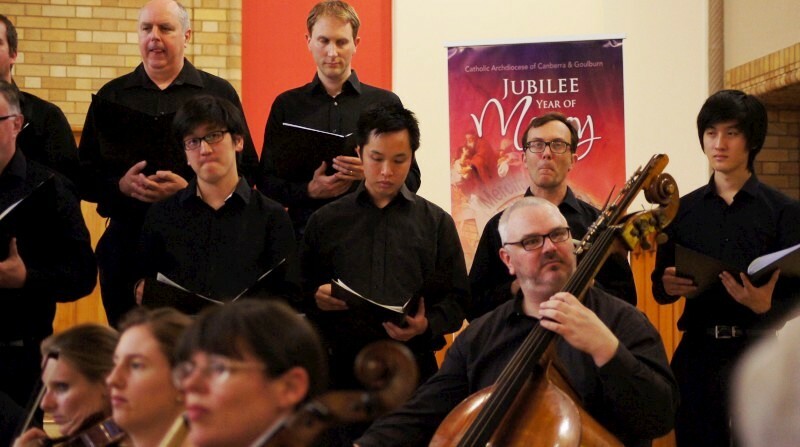 This is a large ensemble with a range of recorders from the descants and tenors down to the boxy, new-styled (and seriously costly) basses. They played a range of music, Mozart, Paisible, Liadov, Bonsor and did it well, but the highlight was an world-premiere, original composition by member Graham Ranft, Requiem Thiepval, a reflection on the Thiepval Cemetery memorial in France, in four parts, apparently recreating the sound of wind through the arch under repair using a dissonant F/F# pair. Then some jazz at night. Tilt played a gig with our mate Richard Manderson sitting in on various saxes. An outdoor gig for primary school kids and their parents, an end-of-year celebration with sizzles and beers. Good fun and an opportunity to let go (for me on EUB and JB) with a beer or two. Always much enjoyed. 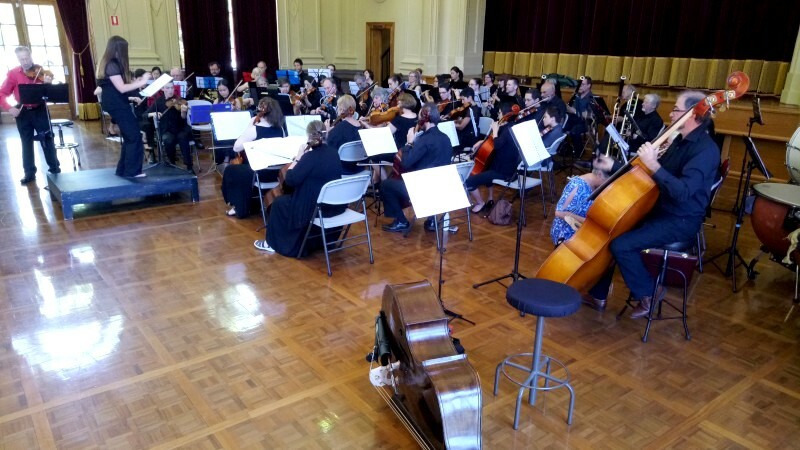 Brindabella Wind Ensemble, U3A Recorder Orchestra and Tilt played at various locations last Thursday. Tilt comprised Richard Manderson (sax), James Woodman (piano), Eric Pozza (bass) and Dave McDade (drums). 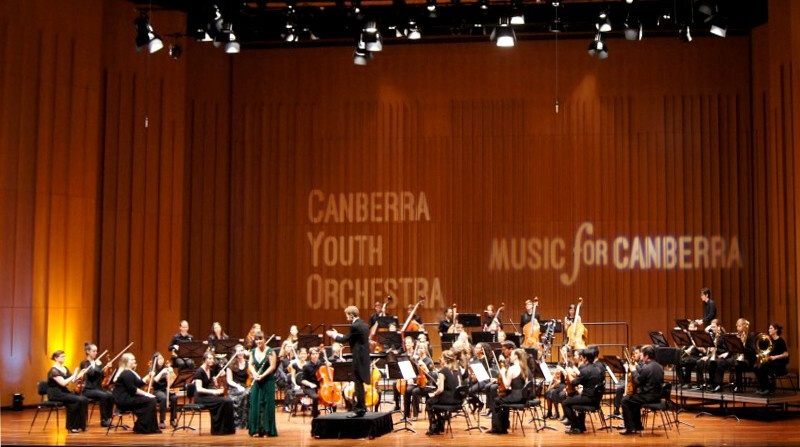 This was the final concert for the 49th year of the Canberra Youth Orchestra. Next year is CYO's 50th anniversary. That makes 1967/68 its founding year, at the height of hippiedom, the Summer of Love, Sgt Pepper's, before the ecstasy of Woodstock and the descent of Altamont. Then disco. And in jazz, Miles' second great quintet and into his electric years, and the death of Coltrane. But the Western classical stream continued and continues. 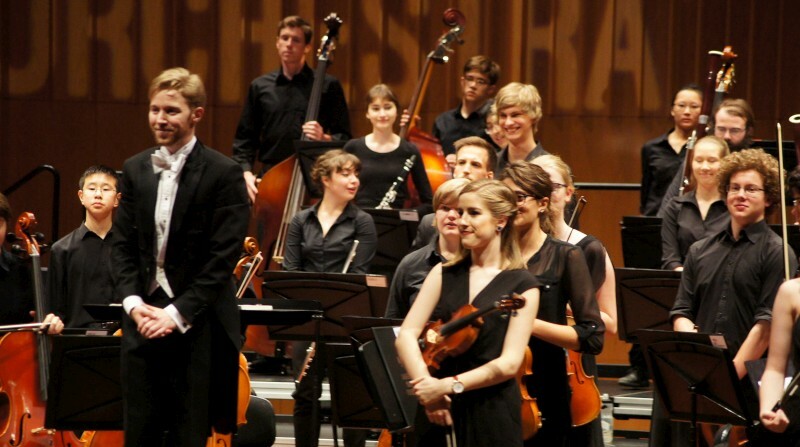 The CYO is a fine ensemble and the musicians excite beyond their almost-tender years. 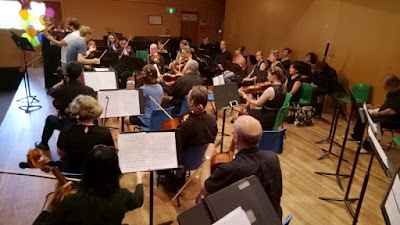 Last night's theme was Brahms, specifically his Symphony no.1 Cmin, as the main work, but accompanied by Chaminade for flute and orchestra with soloist Lily Bryant and Mendelssohn for violin with soloist Donica Tran and Sibelius Finlandia played by unaccompanied brass. The soloists were both hugely impressive and I guess we can expect even more over time. Finlandia is wonderfully evocative and a demanding play for brass alone, not least standing as they did (especially for the heavy metal tuba), but they did it well and it rings so nicely for brass. The Brahms was big, four movements, complex, sometimes innocent and delicate, other-times lyrical and mellifluous (I borrow some descriptions from the program), later bold and triumphant. Some eye-wateringly fast bass lines had me chuckling. Congrats to six bassists! This orchestra is a great training device but more than that, a huge pleasure to hear and follow. And a great buy to boot: get your generously cheap season tickets soon. 2017 features Idea of North, Claire Edwardes and Gabi Sultana, a concerto competition winner and James Morrison. Sounds like some jazz-age partying will seep into the CYO half-century celebrations. 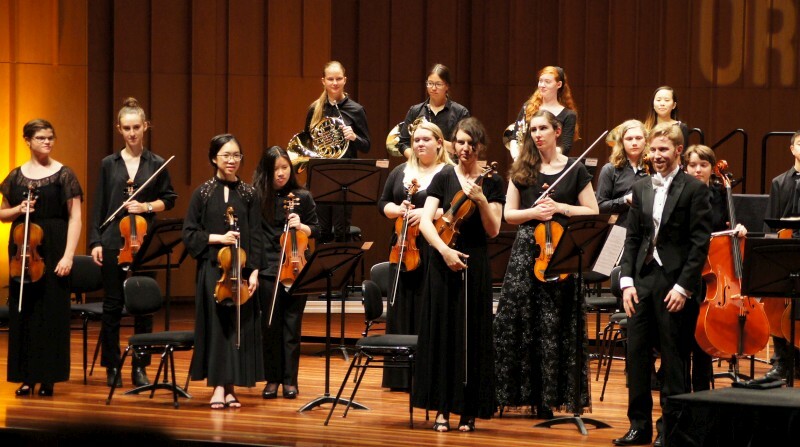 Canberra Youth Orchestra played Chaminade, Sibelius, Mendelssohn and Brahms at Llewellyn Hall under Leonard Weiss (conductor) with soloists Lily Bryant (flute) and Donica Tran (violin). It's funny to think that I cut my middle finger, left hand, cutting a tomato for lunch, and I got through the NCO concerto concert with a bandage. It wasn't so bad (not bad at all) but it's a fear of musicians. 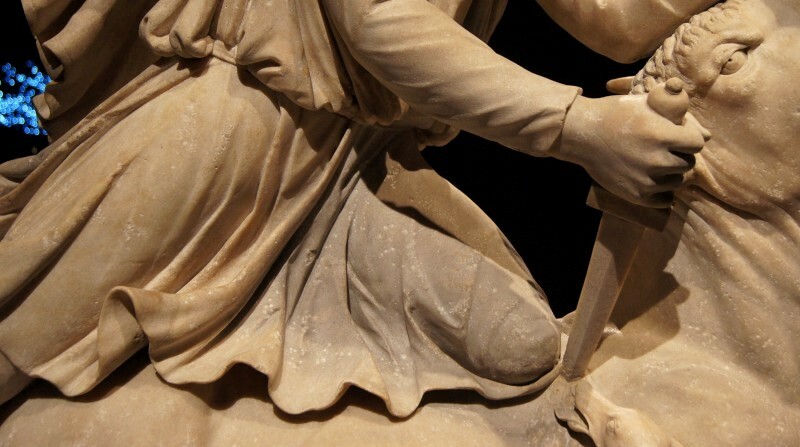 I've heard tell of musicians' hands insured for millions; apocryphal, perhaps, and worthy of some amusement. 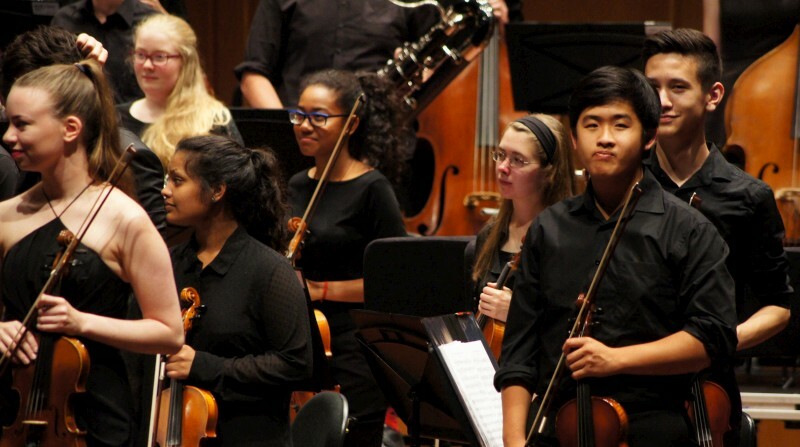 This was the National Capital Orchestra's Concerto Concert. 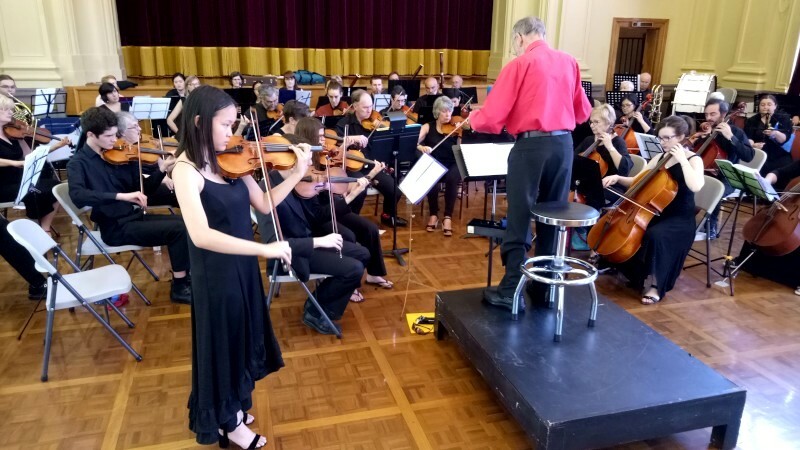 It's an annual end-of-year event where members take the limelight to play movements of concertos or perhaps take the stand as conductor. This time, the concertos were an interesting bunch: for two violas (Prot), for four horns (Schumann) and one more common, for flute (Mozart). Also a few songs from G&S and Verdi and a devilishly difficult piece, Liszt Les preludes, and a famous unfinished symphony (Schubert). It was a varied mixtape of music with plenty of challenges. That's how I like it. As expected, we cut the Liszt better than ever before ("she'll be right on the night") but still not perfectly. That must be a common refrain. The Mozart and Prot sat with nice classical order, so much so that we played the Mozart without conductor, in chamber style. Kaitlin was lovely in the arias and hit plenty of high notes. The four horns fascinated me with their volume and smooth interactions. Interesting to see the ear plugs out in the front rows that took the full force of the horns. (I wished for earplugs for the percussion to finish Liszt: it was ecstatically loud and close behind me). Then to end, Schubert's Unfinished symphony, simple lines but quite compelling. To end my first year with the NCO. I feel blessed. These guys can really cut it. 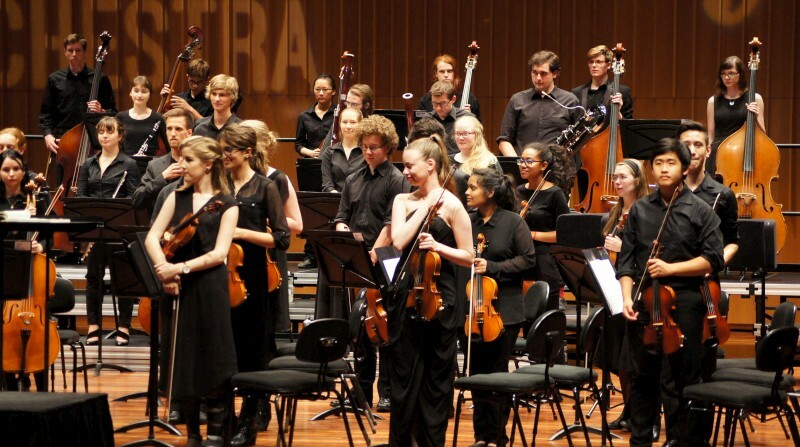 National Capital Orchestra played its end-of-year Concerto concert at John Lingard Hall at Canberra Grammar School. Composers were Liszt, Prot, Mozart, G&S, Verdi, Schumann and Schubert. Conductors were Leonard Weiss and Christian Renglii. 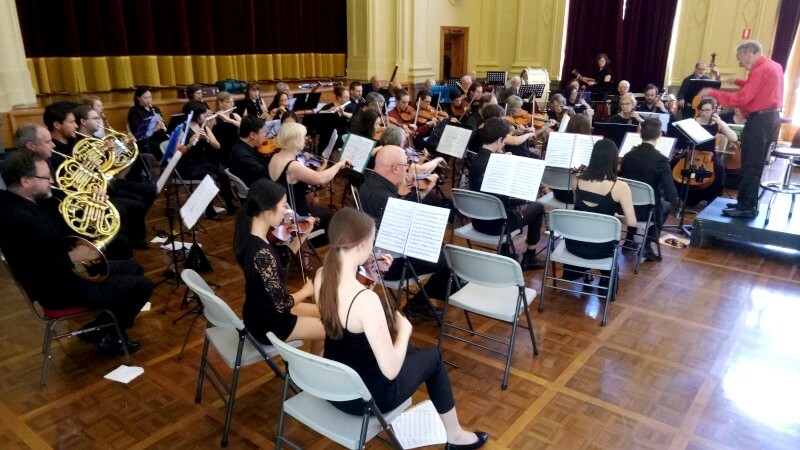 Soloists were Alex Kunzelmann and Suzanna Powell (violas), John Smiles (flute), Kaitlin Nihill (soprano) and Angela Liu, Dianne Tan, Anne-Marie Siiteri and Iain Hercus (horns). These are people I've heard a million times (or thereabouts) but even still it can be magical. 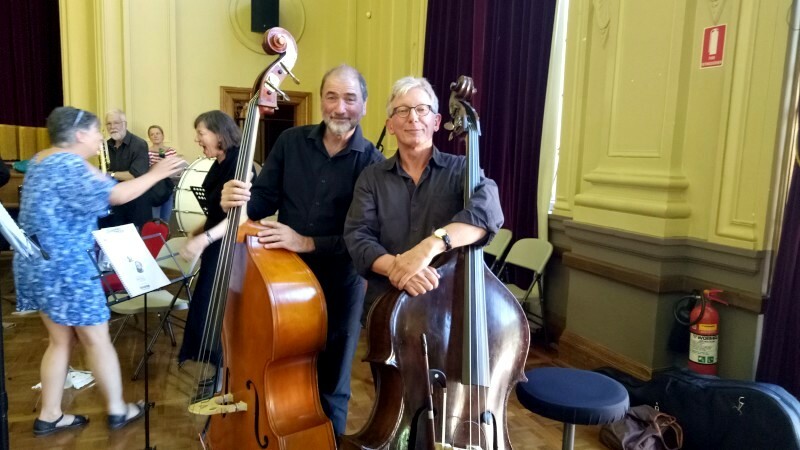 Ambassador and bassist Jean-Luc had gathered John Mackey, Greg Stott and Mark Sutton to feature at a charity gig for Fijian schools. It was held in a relatively bush-like area of the Belgian Embassy gardens. ArtSound provided sound. Attendees were not huge but close and appreciative. Thanks also to donations from a few supporters and refreshments from Stella Artois and Tasmanian Ninth Island winery. I was in front of John, seemingly hearing every nuance from the bell of his tenor and following his uber-developed sense of melody. All the factors were there: time, form, harmony, substitution, extensions. It's in the book of jazz improv but it's a special pleasure to hear it unfolding in real time in real life. There's emotion of course, but not without immense intellect. On that score, I was disappointed to read the recent report on the ANU School of Music fiasco where I found jazz lumped somewhere with rock/pop as a lesser art relative to classical. 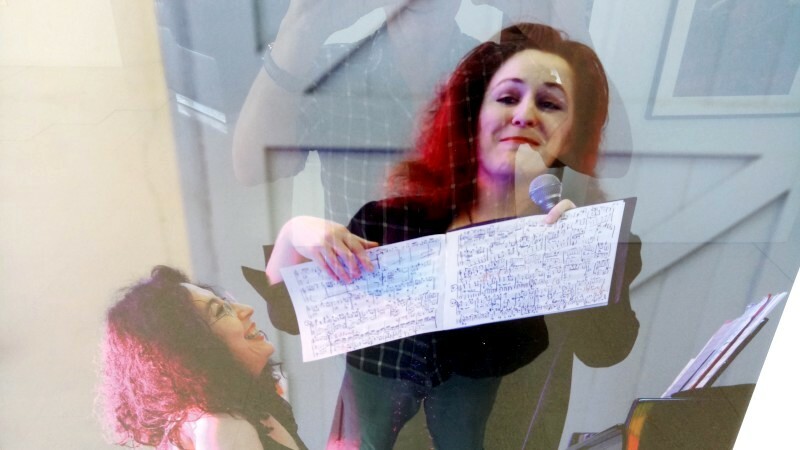 Jazz is nowhere near a lesser art given its demands for theory and technical and emotional skills to improvise in real time while responding to others. But back to the pleasure of hearing this sophistication at close quarters. The clear sound from playing in the open helped. The notes that started or featured in a phrase, the lightly flashed fills, the sixteenth note run that fell endlessly, the scales of various colours, perhaps interrupted by quizzically repeated notes. All immensely satisfying in its exploration and interplay. And a solid band behind. John mentioned later how he often prefers his companions to hold when he goes out. Greg, Jean-Luc and Mark could do that. Mark might be more playful at times, kicking or snapping an accent or two. J-L played his walks and latins with consistency and skills that surprised me, given this is now a hobby for an otherwise busy ambassador and father. But his training shows. And Greg, playing a George Benson model semi-acoustic, simple, crisp toned and unaffected melody with lovely chordal fills and accompaniment. Understated but so pretty and so correct. They played a few of the most obvious standards - Cantaloupe, Softly, All the things, Blue bossa, Stella and the like - but these were anything but ordinary in their hands. Just a grand pleasure of the highest sophistication. Then the Telopea Jazz Band. This is a school band, but I chuckled when someone said "they don't make school bands like they used to". I think that was after Weather Report's Birdland. Birdland? This is demanding music and they pulled it off well. Some Motown, some jazz charts. Lots of kids playing surprisingly well. Again, Birdland, school band? Wow. 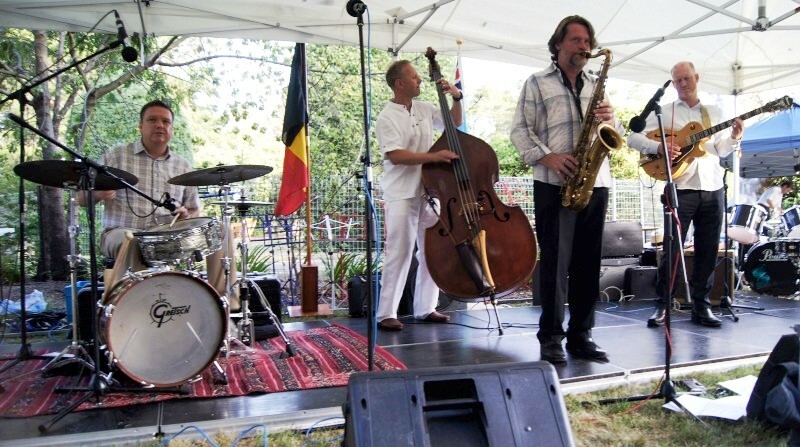 John Mackey (tenor), Greg Stott (guitar), Jean-Luc Bodson (bass) and Mark Sutton (drums) played for an "Adopt a School" Fiji fundraiser at the Belgian Embassy. 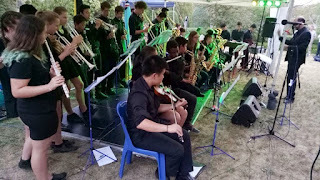 Telopea Jazz Band followed. 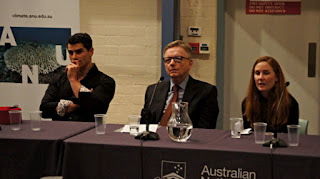 Jeremy Leggett gave the Solar Oration 2016 at the ANU. I've not felt a lot of hope around climate change for a while, what with our politics and Trump and the rest, but I do read there is some: we perhaps have a year or four to turn things around; Paris succeeded and change is "irreversible"; business is coming around and technology is changing rapidly. A few stubborn outbursts still arise, and one was raised in questions: apparently Matt Canavan (LNP, Senator, Qld, Minister for Resources) had that very day extolled coal in the Senate. But even some of those who recognise the science, have some hope. (Only some ... quite a few don't). But I understand, if you give up you have definitely lost, so hope is needed. JL provided some hope in this talk. He spoke of his background, then of the global perspective, under three themes: global society awakening to the threat of climate change; insurgencies disrupting energy incumbencies fast; incumbencies facing multiple threats. His personal story was early years in oil research and exploration (not all geologists and oil-people are denialists), then environmental campaigning with Greenpeace in the 1990's, then social entrepreneurship with Solar Century and a few books amongst this (his latest was the basis of this talk and is available for free download from his site). He further split his talk into ~13 topics, around governments getting serious, public action, regulator activities, divestment and capital, legal actions, prices, batteries and electrical vehicles, efficiencies, role of data, development, utility death spiral ("coal in terminal decline"), oil/gas/nuclear debts, shale boom busted. There were some nice facts: the average age of oil industry staff is 49 (so soon for retirement); solar PV, battery and electric vehicle should have payback of 7.6 years in 2020 without subsidies (ROI 7.3%); little money is yet made in Green tech; Bloomberg: solar/wind to win cost war by 2020; solar lighting (now costing $5) replaces kero in Africa with $70pa saving; the climate wars are an "epic drama"; 4 US cities are already on 100% renewable power; legal actions against VW, Netherlands legislation and Exon-Mobil; solar has been bid at $24/MWh; some buses in Geneva can flash recharge in 15 sec (did I get that right? ); carbon industry debts are rising and unsustainable. Not sure I caught all those correctly, so read the book. But regardless of the positives, "we are in a race against time ... desperate" and at least Paris has "given future generations a fighting chance" (Obama to US Delegation to Paris COP; not sure of precise quote). There were questions. Canavan got that mention above; militaries are not included under Paris, but none-the-less US military is active on reducing carbon; biological fuels; capture of carbon already in the atmosphere ("there's hope but..."); marine and aviation; behaviour change ("we won't shop our way out of these problems"); deniers respond to evidence by going to the bunker; leakage from coal seam gas mining; transition ("none of this happens overnight"; need for a "structured retreat"). And threats (was it HSBC who predicted a possible Oil crash 2013? 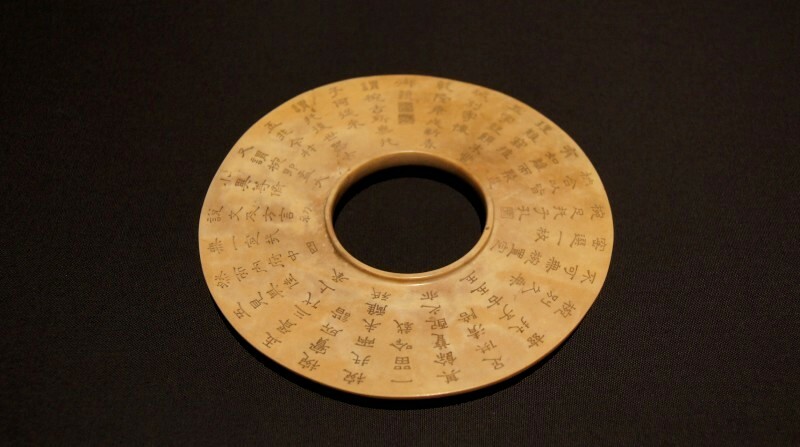 ), but predictions are only perfect in retrospective. In the meantime, there's a G20 Financial Stability Board Task Force on Climate-related Financial Disclosures due end-Dec 2016: keep a watch for this! Lots of ideas and news and some hope, I guess. Jeremy Leggett gave the Carbon Oration 2016 at ANU. 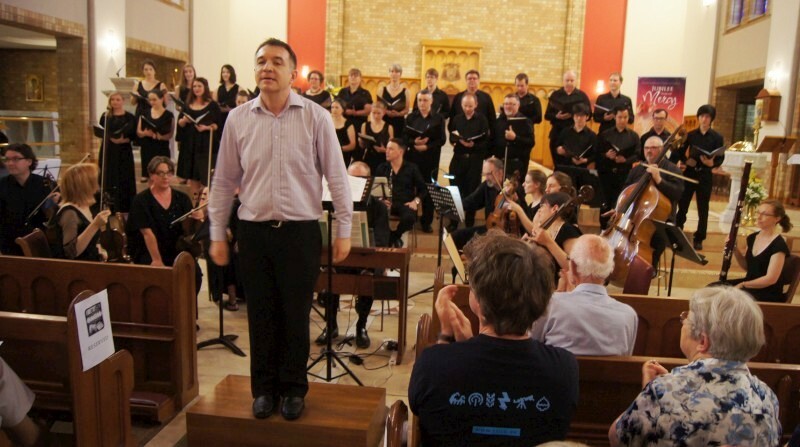 I didn't actually sing at the Harmonia Monday open day concert, but there were times I wanted to. I usually sing with this group. They are guided and conducted by Shiela Thompson and Oliver Raymond, both well experienced local singers. 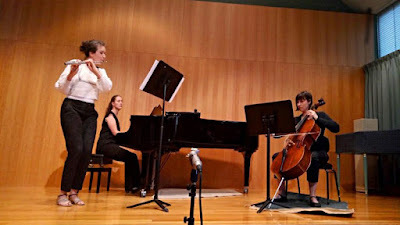 They were, today, accompanied by Jenny Kain and Lucus Allerton, even playing together in one series of pieces, selections from Brahms Liebeslieder waltzes, that required four hands. The program was broad. I like the fact that this is SATB, harmony singing, of works by major composers from Palestrina to extant. There's a lot for me to learn and this is my vocal vehicle. This program included Haydn, Brahms, Vaughan Williams, Holst, Schubert, Elgar and Copland as well as a few arranged traditional pieces. My favourites were Schubert, Holst, Copland and Shenandoah, a famed American folk song, here arranged by Luke Jakobs. These songs settled best with the harmonies that were clearer and time that was more easy. 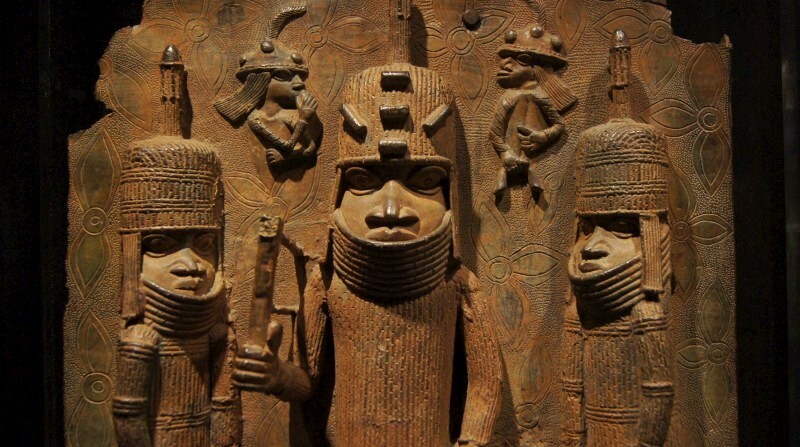 I itched to sing a few lines, I found some harmonies and seached for the tenor lines, although there were few tenors and they are easily overwhelmed in practice. Like most choirs I hear of, tenors - and men generally - are in short supply. But there's a love of the music and some interesting challenges here. Nice one; I'll be back for more practice in the new year. The Harmonia Monday Choral Studies group performed its end-of-term open house concert. Shiela Thompson and Oliver Raymond (conductors) variously directed and by Jenny Kain and Lucus Allerton (piano) variously accompanied. Vespers are an evening sung prayer ritual in the various Christian denominations. 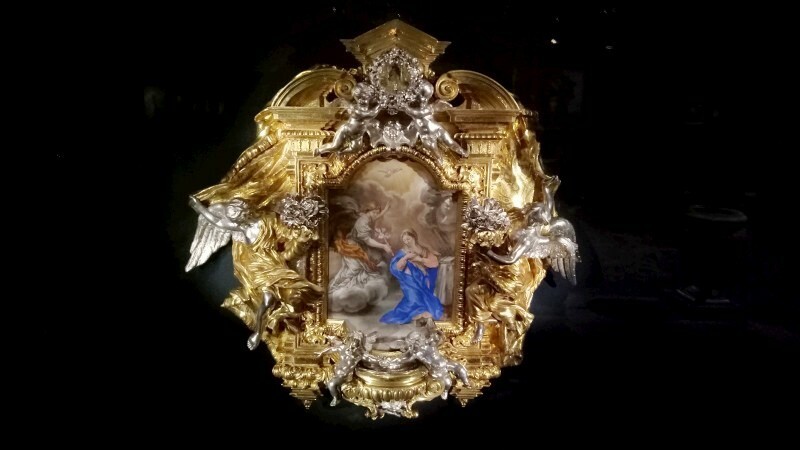 We attended a lovely one with soprano and organ at a Lutheran church in Hamburg so I was interested to hear the Canberra version at our St Christopher's (Catholic) Cathedral. This was quite different: Catholic rites (not sure what difference this made); mixed choral; in English. The English removed a certain mystical, otherworldly presence that the German had to my ears, and the architecture in Manuka is lacking age (as was the internal architecture of the Hamburg church which was rebuilt after the destruction of WW2). But they were similar in musical style (as I remember). I guess this is plainsong, if not religiously correct (excuse the pun). 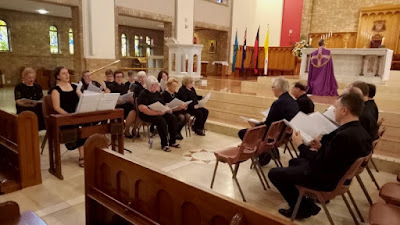 The music in Canberra was written on staves, mostly with treble clef and sometimes with a key signature and there was occasional (small, electronic) organ accompaniment and even some harmony singing on a few numbers, but time was not indicated on the lines to be sung. I enjoyed sitting in where invited by the text, and it's linear, scalar melody with just occasional intervals of thirds or fourths and some slurred intervals, so easy enough to read, and no harmonies to find with everyone singing the same line with you. So, perhaps the English version is less ethereal (at least to our ears) but there's history and calm devotion and nice singing and a good opportunity to sing along, so I enjoyed this one. Vespers are sung monthly at St Christopher's Catholic Cathedral, Manuka. This was the last for 2016: see the website for future dates. The concert was called Dancing through the seasons. The dancing was Habanera (meaning from Havana, Cuba) and tango, a double time with dotted first beat, developed from the European Contradanse and the local black African influences. Tango was a further development, and Piazzolla is probably its greatest exponent. So, various combinations of piano, flute and cello playing Habaneras and Tangos, and so nicely played. The music was infectious from the first notes. Emily opened with two piano solo pieces, and I could feel the incipient thrills from the very first note, followed by those understated but necessarily precise followers. First up, Bizet with his Habanera form Carmen. Everyone knows it. I loved how she played with a wonderful stolidity. Stolid is a frequent pejorative, but not here. 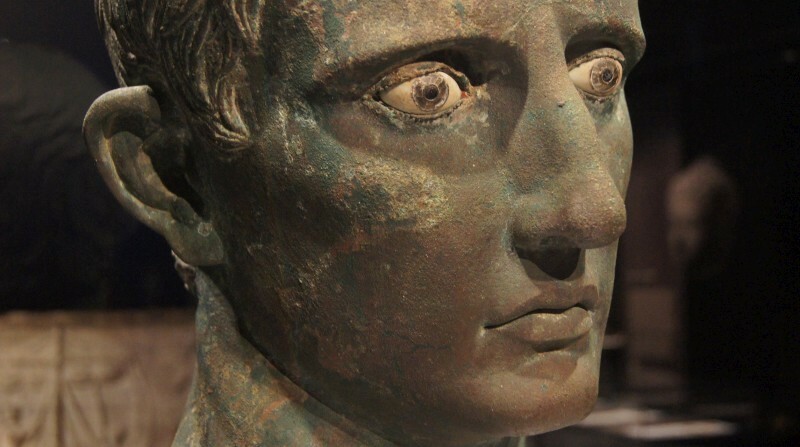 This stolid wrung passion and dignified despair in firm and determined emotions. Lovely. Then Albeniz Tango in D. Another pop tango hit: relatively playful and pensive rather than emotive. Fiona came for Ravel Piece en forme de Habanera, a more complex piece with a modernist lilt and pastoral reflection. Then the major work, Piazzolla Four seasons of Buenos Aires. These are four pieces brought together as one wokr by arranger and friend Jose Bragato. I'm seldom clear in matching the outside world to music and this is not much different, but nonetheless this music is a huge pleasure. Four seasons, starting with Summer, all sudden changes and clearly repeating chords and enigmatic melodies and dense passion and that underlying tango groove (even if the frequent changes make dancing implausible). I've heard Buenos Aires' Maria and seasons and various other Piazzolla and I can only hear it as a massive seduction for the city. Seduction: that seems right for the tango and habanera. This concert was that, in performance and surely in the music. A great pleasure. 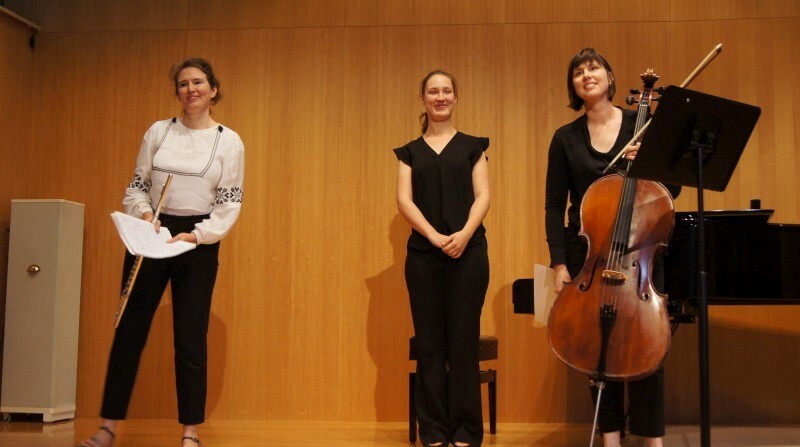 Fiona Dickson (flute), Katherine Wilkinson (cello) and Emily Buckley (piano) performed habaneras and tangos of Bizet, Albeniz, Ravel and Piazzolla at Wesley. Another COP has come and gone and Trump* is threatening Paris from NYC and the world keeps beating heat records and the deniers deny and the scientist warn and the politicians politicise and it all continues as it always has. Until it does no more. That's the threat of climate change: that it all continues until the window for action if passed and things really change. For the worse. We've been warned. Some suggest Paris was the big change: certainly Kyoto wasn't. There are signs of change, even that action is "irreversible" (we were told this word is now included in official documentation), but the big issue is just how quickly that change happens and whether it's quick enough. There was elation after Paris but some wariness amongst presenters at "A postcard from Marrakech: Implementing the Paris Climate Agreement". This event was a report on COP22, convened, or at least hosted, by the EU Delegation to Australia and the ANU Climate Change Institute. It was a sister event to one after Paris COP21 (also reported by CJ) and I guess we can expect another after next year's COP chaired by PNG and held in Bonn. We were told this COP the "new normal for COPs", more on development rather than decisions, working on the "Rule Book" (no doubt essential but not exciting). The Trump election happened during the sessions and the world changed, but the process is "irreversible", even if the US only comes to it pushed and shoved; also during the sessions, the Paris Treaty was ratified (very positively in 1 year; Kyoto took 7 years); also International Civil aviation made decisions on carbon offsets and the Montreal Protocol agreed to reduce HFC (greenhouse gases but outside Paris); but also a new Potsdam Institute report of climate sensitivities suggested we are tracking higher than previously thought, on track for 4-7degC (!). At least with the "new normal" we are "over the worst of the politics". Other observations: business and non-staters are now central to action; technology is changing unexpectedly rapidly (with implications not least for coal); equity remains an issue (the industrialised countries created the bulk of the problem) but the Adaption Fund and developing country actions are looking better (India and China are sounding good on climate change - immensely better than coal-munching Australia); developing countries need to adapt more than mitigate and South-South networks are developing to support adaption; thermal coal is looking on a steep decline, although metallurgical coal remains an issue; military carbon is exempted from reporting, but interestingly the US Military is progressing very well; business adaption is "quite astonishing" given new tech and awareness that action is now for real; "blue carbon" is carbon in the sea, and it's important and now being considered. 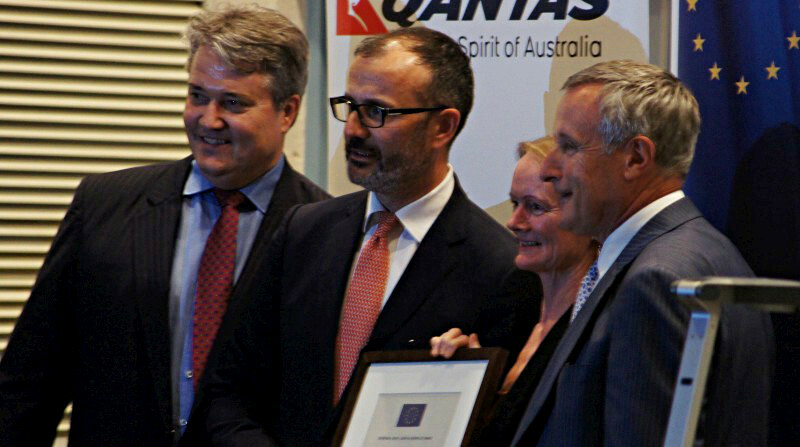 Nice to hear our Australian delegation described as "responsive, pragmatic, helpful". I don't find it hard to conceive of our bureaucrats as that, or even our political reps (Julie Bishop and Josh Frydenberg) who are probably at the forefront of a disappointing government. Politics is more difficult than we outsiders allow for: I just hope there's a secret plan to restore sense to this issue in Australia (perhaps that's the Climate Review 2017?). 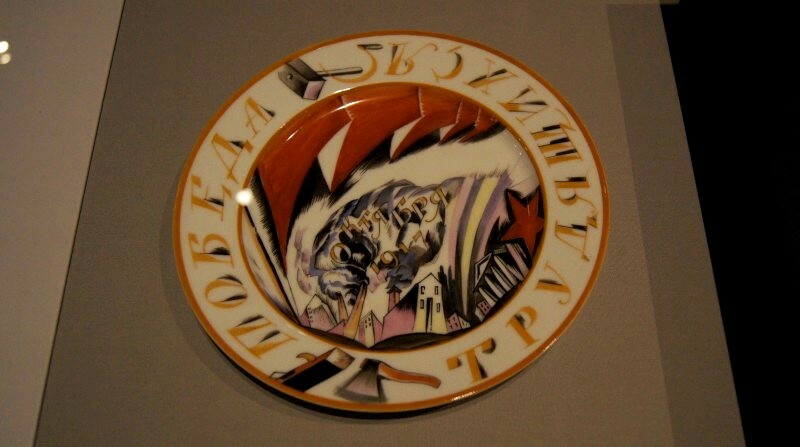 The central theme remained, reasserted several times during the night: there's "no argument change is needed, but how quickly action will happen", or we've "got to go much faster in all directions". But there was one moment of excitement when the Canadian Ambassador outlined actions under Trudeau: introduction of carbon pricing; invitations to scientists to educate Premiers and public; increased transfers to poorer nations; commitment to eliminate coal by 2030; but the biggest, Trudeau's leadership in promoting climate change as the "greatest challenge and greatest opportunity". A breath of fresh air for tired Australian ears. We spoke to the Ambassador after and this doesn't happen overnight, but there's obvious leadership (happily informed by evidence, strange that...). 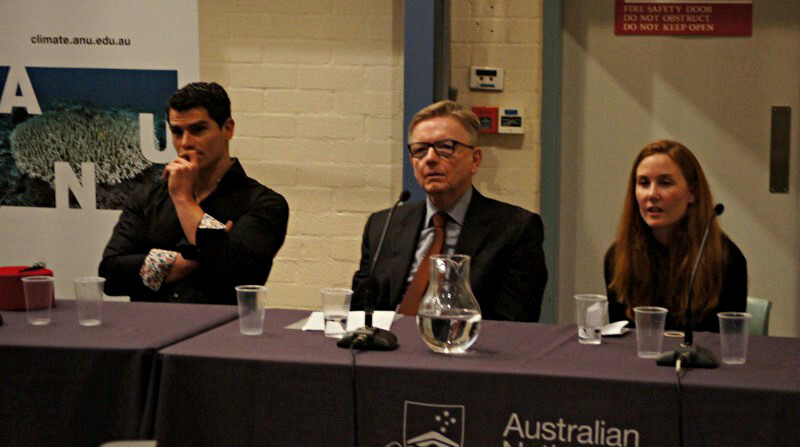 We also spoke to our Australian rep at the event, Jo Evans of Climate Change and Renewable Innovations. She invited our submissions to the review in 2017 and listened to my despair. That couldn't have been easy so thanks to Jo. 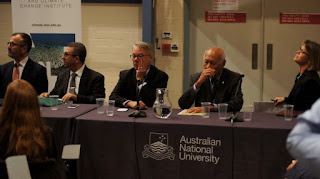 A postcard from Marrakech : Implementing the Paris Climate Agreement was hosted by the EU Delegation to Australia and the ANU Climate Change Institute at the ANU. 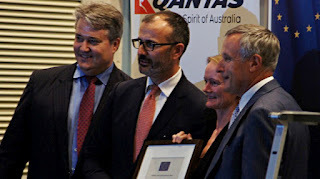 Speakers included academics Howard Bamsey, Luke Kemp, Hannah Barrowman and Richard Baker, diplomats Paul Maddison, Sem Fabrizi, Karim Medrek and Charles Lepam, local bureaucrat Jo Evans and journalist Angela McDonald (presented with an award at the event). This being the run-up to Christmas, these were for Advent and again we were regaled with a generous program of four Bach cantatas. It was Andrew Koll's return with his rebirthed Canberra Bach Ensemble and it was several hours of great beauty and order and often of spine-chilling thrills. I can only hear the choral segments as a thrill, especially at the end of a cantatas, after the more subdued recitatives and arias. For when the chorus releases, all hell breaks loose. No, that's certainly the wrong metaphor, for Bach composed for the glory of God and these are clearly and transparently glorious, as well as gorgeous. I don't bother to follow the text (sung in German with an English translation). Perhaps I should. 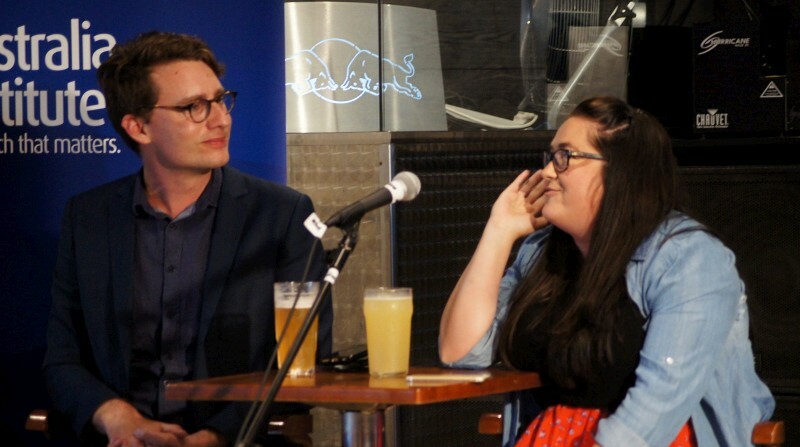 Just once I did, when soprano Emma and bass Andrew were singing to each other with quizzical smiles. I discovered he was Jesus and she was the Soul and they were pledging that their love would never part and committing to graze together amongst the roses of Heaven. Apparently, this cantata associates with a Gospel reading (Matthew 25:1-13) of virgins awaiting the arrival of the bridegroom. 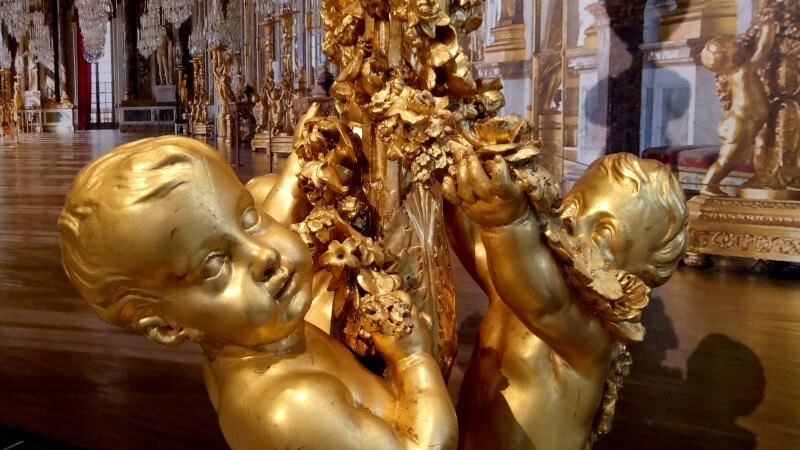 These are celebrating a central Christian feast, after all, and it is of a different era, even if the music doesn't sound out of place for modern ears. But I just listened. Enjoying the interplay of solo voices, the engulfing chorus parts, the structure and counterpoint of instruments with their ever-forward baroque motion. And it all sat so well. Andrew has drawn together a wonderful cast of performers so there was so little to query. I loved that double act of soprano and bass towards the end of the performance. I admired Leanne's busy violins and Dave's excellent bass part, sometimes doubled by Kristen on bassoon or Anthony on organ or Gillian and Clara on cello. I enjoyed the solo arias but especially the sparse, spacious recitatives, where story is told with minimal orchestration, just one or two instruments, continuo organ with cello or perhaps violin. And the choir of 27, occasionally featuring the tenors alone, or a soloist who walked out front for a role. 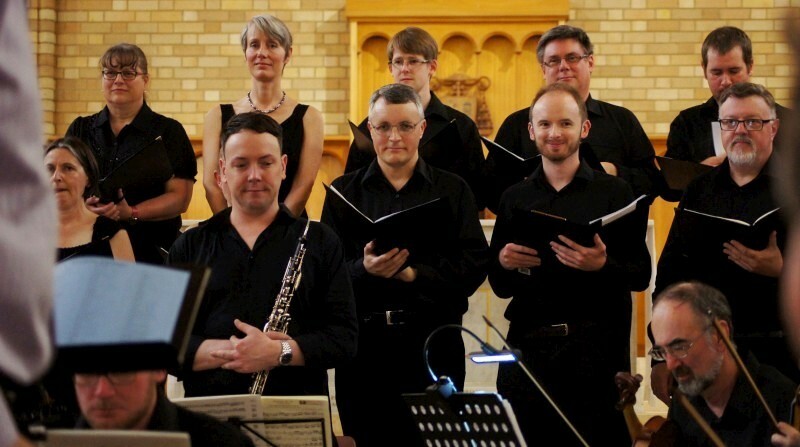 They performed four cantatas, BWV 61,36,62 and 140. Someone commented that a concert of one composer is to be preferred. I'm not sure (I don't mind Beethoven with Mozart or even Glass). But this was just Bach and it was wonderful. Congrats to Andrew for a successful outing and for the renewed CBE. A great pleasure to be enveloped in several hours of such glory. 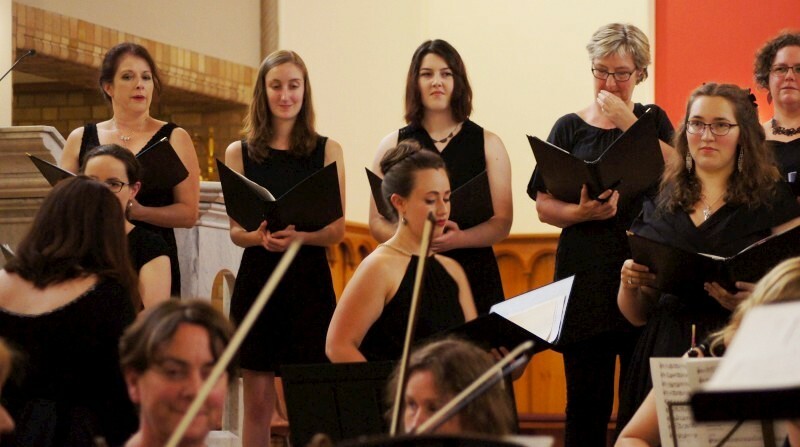 Andrew Koll (musical director) conducted the Canberra Bach Ensemble playing four Bach advent cantatas at St Christopher's Cathedral. 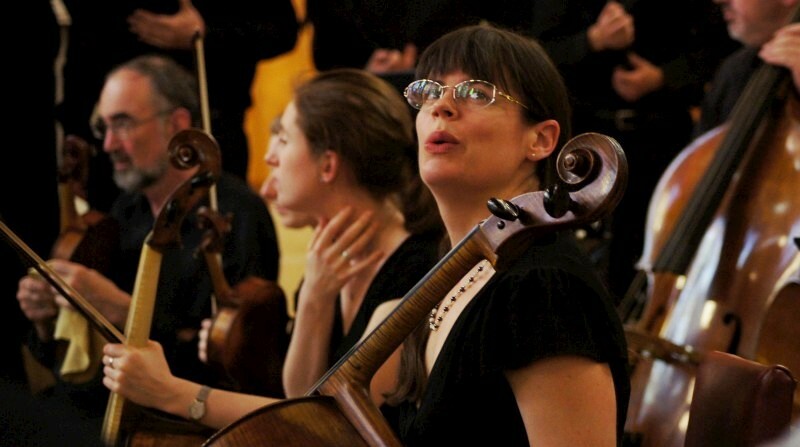 Leanne Bear (violin) led the orchestra. 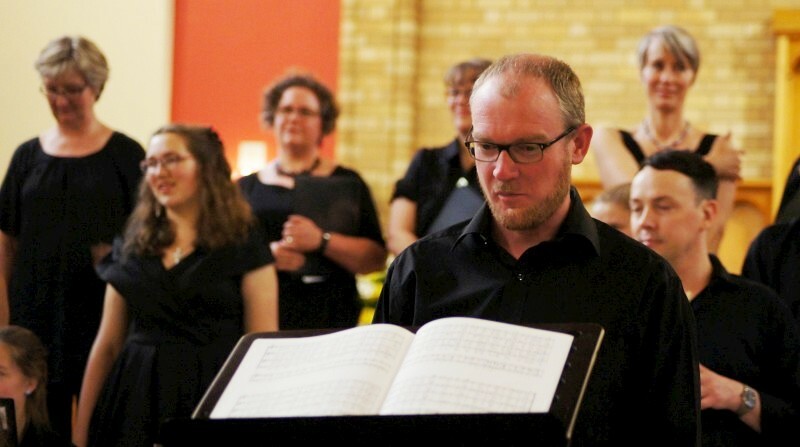 Vocal soloists were Emma Griffiths, Chloe Lankshear and Keren Dalzell (sopranos), Maartje Seventer (alto), Paul Sutton (tenor) and Andrew Fysh (bass).